The Table Table restaurants have released a new menu in time for spring. When I was invited to go and review it at one of the local branches, I couldn't say no! with his Granny and Grandpa at home. which I happened to noticed also had some disabled parking as well. Horse and Jockey are close to Dunstable Downs & Whipsnade Zoo, so they are perfectly placed for family days out. The garden looks like the ideal spot for a bite to eat during the summer months. We actually arrived earlier than the table was booked for as we had chosen the table to be booked for 6:30 pm just in case of rush hour traffic. We went in and told them that we had a reservation but we were early, however they were more than happy to show us to our table and let us order. We got to sit at a table that was looking out the window so that we had the view of the road and countryside. Once we were seated we asked to have a look at the wine menu. the new wine menu as of yet. We wanted to go for a rosé wine which they were happy to give recommendations of. prior to our visit so knew what we were most likely going to go for. The Menu itself had a large selection of starter, main, side and dessert dishes. We were very impressed with the varied selection on offer and found it hard to choose from. would have taken much longer to make our choices otherwise. I also had a little peek at what they had to offer for children too which was on a separate menu and was also impressed with the selection they had for little ones. 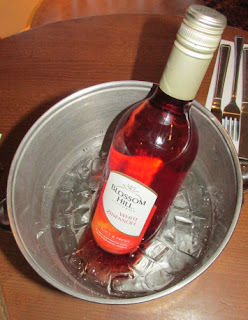 The wine that we chose to go for was the Blossom Hill White Zinfandel which is a refreshing palate of lovely rosé with aromas of ripe strawberries and juicy watermelon. Soft and aromatic. I don't drink that often but when I do and go for wine, rosé is by far my preferred choice. Stuart chose to go for the Wasabi King Prawns which is served with a pea and mint mayo dip. He said " They are very light with bubbly batter. They had a perfect balance of heat with freshness." For my starter I picked out the Smoked Salmon. The smoked salmon came with malted brown bread and horseradish cheese. horseradish cheese. The cheese had the lovely horseradish taste but without being too overpowering. Stuart went for the New Zealand lamb rump which came with a rich malbec sauce, mint crushed potatoes and cauliflower cheese. He said " The lamb was cooked perfectly ( well done) as requested. The potatoes and cauliflower cheese were delicious with ample portions." I also went for lamb but a lamb pie. The pie was served with mint mash, kale and gravy. very filling too so I must admit I was wondering how I could fit dessert in. Vanilla ice cream mixed with After Eight® pieces, drizzled with mint syrup and chocolate flavoured sauce and topped with a whip of cream and an After Eight® mint. Stuart said " A perfect after meal refreshment"
so long I forgot how good they are. Both Stuart and I both agree that we would definitely go back there again. If you like the look of the wonderful food and experience we had why not book a table for Easter! all thoughts, photos and opinions are of our own. Not a huge fish eater but I know my oh would really appreciate those prawns. Desserts have my mouth watering. The food presentation is brilliant. Really like the look of this place! The food looks gorgeous, really well presented, and it looks like a really warm and inviting atmosphere! Absolutely loving Stuart's quotes. Sounds like a nice place. Sounds like a great new menu and glad they have lots on offer for the kids too. I don't think we have any Table Table restaurants near us, but I'd definitely be trying one of those sundaes if we did! Looks really good. I think the wasabi king prawns sounds really nice and the desserts - yum! Ooh, we have a Table Table near us but I've never been. Might have to change that over the Easter holidays, the food looks lovely. We don't have any Table Table restaurants down my way but I've heard such good things about them. This looks like a great restaurant though I would have liked to hear more about the children's menu. All too often it's something and chips only. Did this offer any more variety? 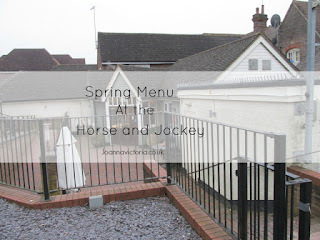 I love the Horse and Jockey, think I'm going to have to visit there soon! I actually find the Table Table restaurants really lovely. I've only ever been to one though. The smoked salmon looks so good but to be honest I don't think I'm going to be able to eat it any time soon, as I have spent 3 days in a row eating it! hehe! Don't really like lamb and black forest cake but the dessert and other options on the menu look delicious.